What would it take to build a more just economy, one that benefits all participants, not just the top income earners? That’s a question our Executive Director, Dana Geffner, thinks about a lot. And, today, as a new Fair Trade Charter is launched, she’s not alone. The new charter proposes a path forward for business to be a tool for development, and for all trade to build on the principles of fair trade, growing sustainable livelihoods, thriving communities, a healthy planet, and decent work for all people. Today, Dana shares her thoughts on what it means to live those values and reflects on her current travels in Ghana and Togo with two companies who are leaders in the fair trade movement. Driving to Accra, Ghana after getting off a long flight from the U.S. was sure to be an adventure. I’m with David Bronner, Cosmic Engagement Officer of Dr. Bronner’s, a $125-million-dollar natural product brand on the way to visit their palm oil project. And to add to the excitement, our travel companion for this 8-day journey to Ghana and Togo will be Olowo-n’djo Tchala, founder and President of Alaffia and a native of Togo. Alaffia is another inspirational high quality organic fair trade body care brand that works throughout Togo and Ghana. Both organizations believe working with organized communities is the only path forward to building a more just economy. We are all aligned on this journey. There will be a total of eight of us, four Dr. Bronner’s people, three from Alaffia, and then me, Fair World Project’s Executive Director. This will be my third trip to Ghana and Togo to visit Dr. Bronner’s and Alaffia projects. It is not an easy trip but definitely worth the hours spent in planes and automobiles. Dr. Bronner’s palm oil project, Serendipalm, is the only sustainably produced organic, fair trade palm oil in the world and is used in their bar soaps. 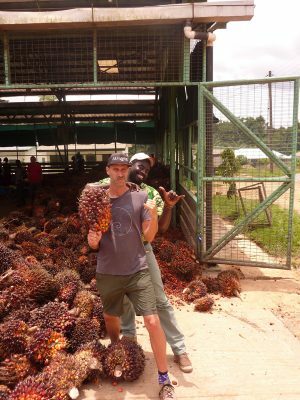 I have not traveled to Ghana with David before, but I did travel with Olowo-n’djo to Serendipalm in 2016 and this is when he learned that he could buy Serendipalm’s palm kernels, a byproduct of producing palm oil which Serendipalm had not needed and often sold into the local market. My job, as Executive Director of a fair trade advocacy organization, is to figure out how to engage people to be politically active citizens and socially conscious consumers. Throughout my tenure in the fair trade movement, I have found that my passion also is connecting like-minded businesses so they can work together, learn and grow from each other and ultimately build a more just economy that benefits local communities. And this was exactly what had happened. Our 3-hour drive after getting off an overnight flight was tough. But finally, we arrived at the plot of land that Serendipalm has purchased in order to monitor the carbon sequestration. While so much of what we hear about palm oil is about deforestation and destruction, this is the opposite. Here, palm trees grow in a fully integrated agroforestry system where intercropping and cover crops are key to sequestering carbon to help reverse climate change. I return from this trip the day that the new International Fair Trade Charter is released. The document was a combined effort of several fair trade organizations, including Fair World Project, with the goal of sharing with the world the vision of what global trade could do if it was based on solidarity, justice, equity, and sustainable development. The new international fair trade charter deepens our understanding of why fair trade is so important. We’ve reached an extreme of globalization in which large corporations continually chase cheaper labor practices across the globe. Industrial agriculture is expanding, deforesting land around the globe at an alarming rate. Income inequality is on the rise and large corporate actors have ever-greater wealth than small-scale producers. Yet there’s another way to do business. I’m traveling with two of the most successful soap and beauty products companies in the natural products industry. On the store shelves, conventional wisdom tells us that they are competitors. But here in their supply chains, they’re working as collaborators. This trip encompasses what I believe together we can accomplish in the fair trade movement. Working and organizing together in our advocacy work, our production work, our marketing, our promotions, and most importantly, supporting small-scale producer organizations within their own communities under their own rules. Together, we can build a more just economy on the principles of fairness, equity, and justice for all. This is another example of successful cooperation of competitors so that both can thrive and provide living wages for employees and a sustainable environment for both crop and workers. Corporations use a different method. Corporations maximize profit without regard to devastation and then move on to do the same to another area. Corporate execs do not have to live with the destruction and poverty they generate, only with the high salaries and advantages that high profits bring them.